All week, I was focused on Sunday. Surf City would be my third half marathon in three months and I had some expectations of what I wanted out of this race. Rock N Roll Vegas was simply for fun (1:44:27) - a great first race 7 months post knee surgery. When I started running that first mile, I felt like I almost had forgotten how to race. I have never smiled so much during a run and I finally felt like my old running self again. 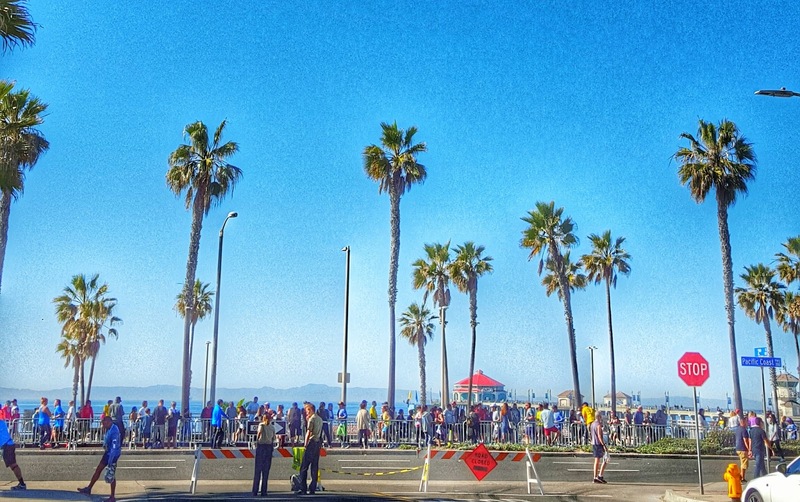 Mid December I ran the Santa To The Sea half marathon (1:39:03). By then I had 4 more solid weeks of training under my belt and I went into the race with a little more confidence. I knew my body was capable of running under 1:40 and all I had to do was execute, stay strong and believe. 8 weeks have passed and I have been very consistent with strong mileage, speed and hill work with continued strength, core and PT exercises. In my mind, I felt like it was time to break my PR. I'll start with Friday. I had an all day women's event at my church and got home just after 10 PM. I was really cold almost the entire evening despite the fact that I had on a sweater. I knew Friday was the most important night of sleep before a Sunday morning race, and was anxious to get to bed. Saturday. Ah, Saturday. The women's event at my church was continued all day today, followed by me driving down to Newport Beach to spend the night with one of my dearest friends. The church event started at 9 am. I woke up at 9 am. Anyway, I woke up feeling pretty awful and run down. My throat was a bit scratchy and all I wanted to do was sleep. I knew at that moment, if I wanted to race the next day, I would have to rest. I stayed in bed most of the day. Every time I got up to eat or drink, I couldn't wait to go back to sleep. Finally, late in the afternoon I felt good enough to go for a 3 mile shake out jog. I kind of slogged my way through it, but I felt better. The rest was what I needed. Hung out with my family the rest of the afternoon and then made the trip down to Newport Beach. 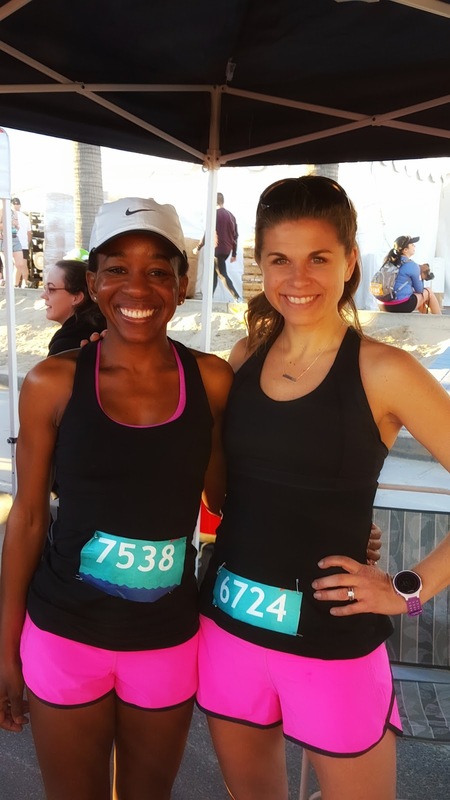 My friend Kristin and I would be running the race together and I was so excited to see her. She is a friend that everyone needs - so sweet, positive and absolutely radiates joy. You can't help but smile when you are with her! By the time I arrived at her house, she had cooked a pasta dinner for me, we talked for a bit and then we both couldn't wait to go to sleep. Sunday morning. The alarm chimes at 4:45 am and I could hear myself groaning. How did the night go by so fast? Finally at 5:15 I dragged myself out of the warm, cozy bed and began to start the day. Race outfit on, a piece of wheat toast with almond butter and about 4 glasses of water (one glass with a grape flavored Nuun tablet - also I stop drinking fluids 2 hours before a race) and I was ready to roll. We were riding with two of Kristin's friends and we all arrived in Huntington Beach and at the starting line about 6:30 am, with a 7:45 am start time. My coach wanted me to do a 1 mile warm up followed by dynamic stretching and to be warm, revved up and ready to go at the start. I went a half mile over on the warm up and felt good and ready to go at the start. 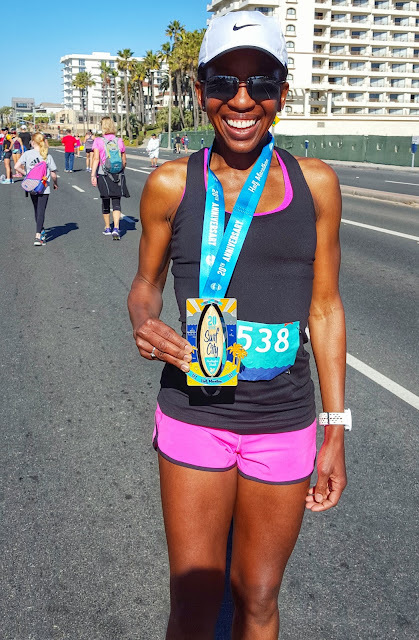 I decided to line up with the 1:35 pace group and see how I felt. I wanted to make sure not to start too fast, but I felt like I was capable of running 1:35 for this race. My PR (You will not believe this): 1:36:43 - exactly. I couldn't believe it. The exact time - even down to the seconds! As you can see, the race started falling apart a bit after mile 7/8. I am not making excuses - but I will say, I just don't race well in heat. So with this race, the turn around occurs at about mile 8. 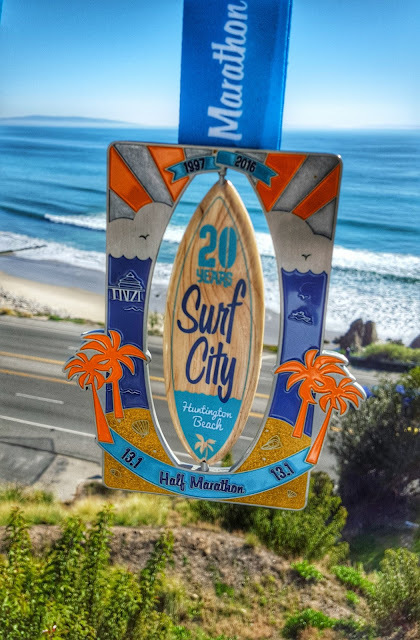 From mile 8 to the finish, we were running on PCH, with the sun beating down hard - right in your face. It was a gorgeous day, but for me it is tough when I have to run in heat. This was a perfect exercise in self talk - I kept telling myself not to fall apart. Pick up your feet, adjust your posture, focus, you can do hard things!! One of Kristin's friends passed me at about mile 10 (she went on to run 1:35 and Kristin's other friend went on to run 1:29!!! I need to train with these speedy, inspirational women!) and she said: "Come on Nat!" In my mind, I knew if I could respond to that and stay with her, I would run the time that I was aiming for. As she bounded by me with all the energy in the world, I could feel myself wilting. I didn't respond, but no way was I giving up! Just so you know with this race, after mile 8, there are zero hills or turns - nothing but flat paved road. It might sound wonderful, but I was craving a hill - something to break up the monotony. I see mile 13 looming in front of me and glanced at my watch. If I started sprinting, could I squeak by in 1:35:5something?! Not meant to be, but I was happy with my time. I am moving in the right direction - chipping away at my time, getting faster, heading toward the ultimate goal of Boston. I finished 3rd place in my age group, which was a huge surprise as this is big race with a lot of fast women. 34th woman overall. I will race again sometime in the first 3 weeks of March - looking for anything from a 10k to a half. A big part of me wants to race another half next month, so we'll see. - A flat course, but not necessarily a PR course. I say that not because I didn't PR, but I have talked to lots of runners who felt the same way. - The marathon starts at 6:30 am and I almost wish the half started at the same time. 7:45 the sun is blazing and by 9 am, it was HOT. - There is music and lots of fun after the race, you are RIGHT on the Pacific and it is simple stunning. A great place to hang out for the afternoon. I'll have a report coming next on my training for last week. 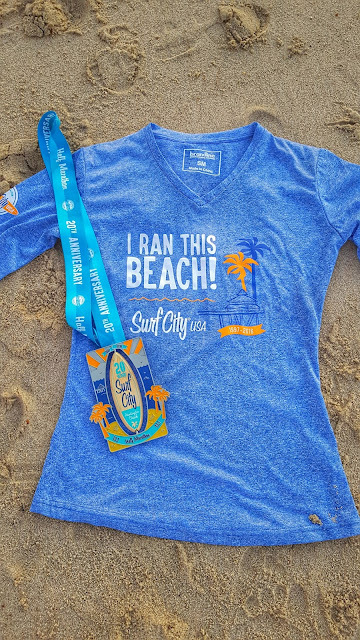 Would you rather race in weather a little too cold, or a little too warm? What is the coolest race medal you've earned? Coolest t-shirt?